Pennsylvania’s design is a keystone, after the state’s nickname. Kansas uses a sunflower, which is the state flower. Utah uses a beehive since it is known as the beehive state. Washington uses a silhouette of George Washington’s bust. California is the only state not to use a square or rectangle. North Dakota’s “Red Tomahawk“ design is slowly being replaced by the state’s outline. Colorado design includes their state flag. 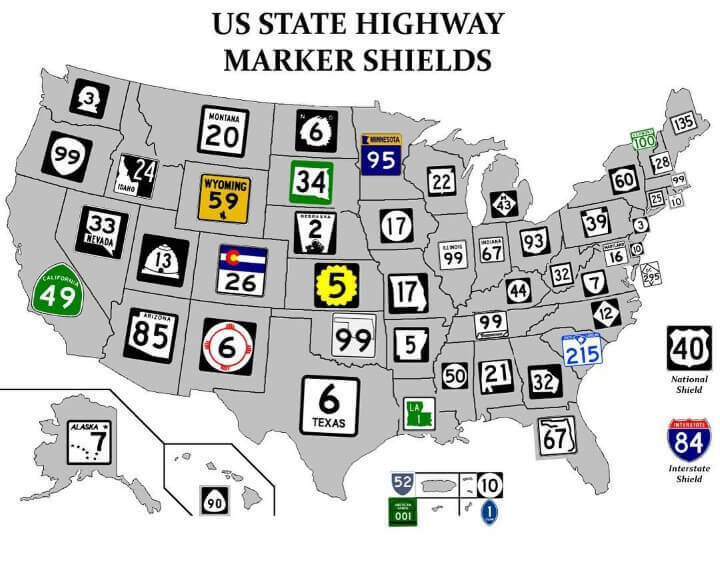 Alabama, Arizona, Arkansas, Florida, Georgia, Idaho, Louisiana, Missouri, Nevada, Ohio, and Oklahoma all use their state’s outline. This sentences omits South Dakota, which also uses its outline as a shield. Additionally, North Dakota has changed its standards to include its outline.